The taxi rank as the centre, with each high street emanating from this, overlapping with existing businesses. A phase 1 pedestrian route along market stalls to the taxi rank. Future phases from the taxi rank outwards, toward the Mfuleni Business Facility, and along an existing path alongside recreational facilities. With the anticipated urban maturity, it then becomes a central High Street, which supports existing businesses along these routes. An overall pedestrian and public transport focus underpins this roll out programme supported by community work groups / communications programmes This proposal is a design-led strategy intended to promote the development of a coherent and safe, pedestrian-centred High Street in the area around the Mfuleni Taxi Rank. 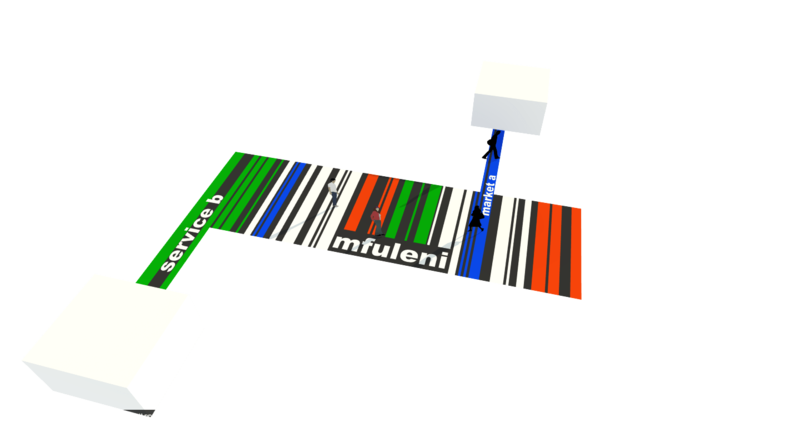 The Mfuleni Taxi Rank, literally and figuratively forms the centre, through which the Mfuleni High Street model design proposal is conceived.